Overall growth slowed, but Middle Eastern, non-Mexico Latin American, Asian, and sub-Saharan African populations grew substantially. 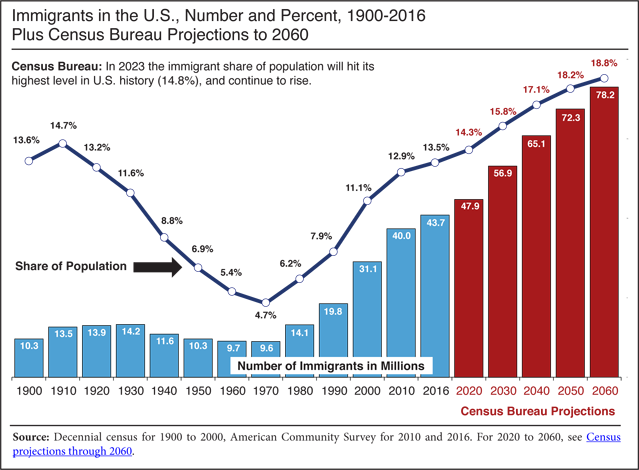 On September 14, 2017, the Census Bureau released some data from the 2016 American Community Survey (ACS) that shows uneven growth in the immigrant population in the last year. The number of immigrants (legal and illegal) from the Middle East, Latin American countries other than Mexico, Asia, and Sub-Saharan Africa grew significantly, while the number from some places, such as Mexico, Europe, and Canada, grew not at all or even declined. The Census Bureau refers to immigrants as the foreign-born, which includes all those who were not U.S. citizens at birth. 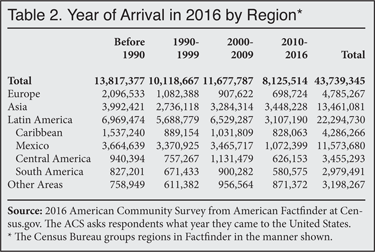 The Department of Homeland Security has previously estimated that 1.9 million immigrants are missed by the ACS, so the total immigrant population in 2016 was likely 45.6 million. The nation’s immigrant population (legal and illegal) hit a record 43.7 million in July 2016, an increase of half a million since 2015, 3.8 million since 2010, and 12.6 million since 2000. As a share of the U.S. population, immigrants (legal and illegal) comprised 13.5 percent, or one out of eight U.S. residents in 2016, the highest percentage in 106 years. As recently as 1980, just one out of 16 residents was foreign-born. In addition to immigrants, there were slightly more than 16.6 million U.S.-born minor children with an immigrant parent in 2016, for a total of 60.4 million immigrants and their children in the country.4 Immigrants and their minor children now account for nearly one in five U.S. residents. Longer term, the regions with the largest numerical increases 2010 to 2016 were East Asia (up 892,209), South Asia (up 889,878), the Caribbean (up 554,903), the Middle East (up 471,029), Sub-Saharan Africa (up 456,989), Central America (up 402,784), and South America (up 249,660). The sending countries with the largest numerical increases since 2010 were India (up 654,202), China (up 550,022), the Dominican Republic (up 206,134), El Salvador (up 172,973), Cuba (up 166,939), the Philippines (up 164,077), Honduras (up 128,478), Vietnam (up 112,218), Venezuela (up 106,185), Guatemala (up 104,883), Nigeria (up 87,565), Pakistan (up 83,271), Haiti (up 81,074), Bangladesh (up 80,949), Jamaica (up 76,532), Ethiopia (up 71,332), Brazil (up 69,982), Colombia (up 68,032), Iraq (up 61,787), Burma (also known as Myanmar, up 60,294), Nepal (up 59,992), and Saudi Arabia (up 54,833). 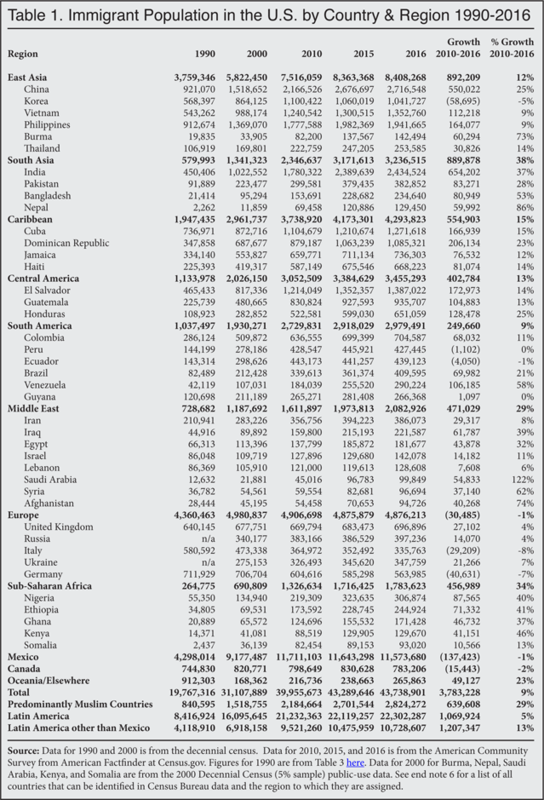 The sending countries with the largest percentage increases in the number of immigrants living in the United States since 2010 were Saudi Arabia (up 122 percent), Nepal (86 percent), Afghanistan (up 74 percent), Burma (up 73 percent), Syria (up 62 percent), Venezuela (up 58 percent), Bangladesh (up 53 percent), Kenya (up 46 percent), Ethiopia (up 41 percent), Nigeria (up 40 percent), Iraq (up 39 percent), Ghana (up 37 percent), India (up 37 percent), Egypt (up 32 percent), Pakistan (up 28 percent), and China (up 25 percent). The states with the largest numerical increases in the number of immigrants from 2010 to 2016 were Texas (up 587,889), Florida (up 578,468), California (up 527,234), New York (up 238,503), New Jersey (up 171,504), Massachusetts (up 140,318), Washington (up 134,132), Pennsylvania (up 131,845), Virginia (up 120,050), Maryland (up 118,175), Georgia (up 95,353), Nevada (up 78,341), Arizona (up 78,220), Michigan (up 74,532), Minnesota (up 73,953), and North Carolina (up 70,501). 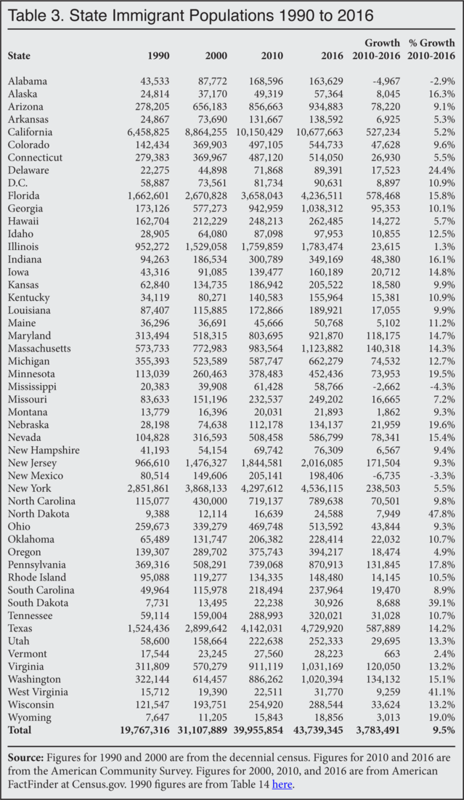 The states with the largest percentage increases in the number of immigrants 2010 to 2016 were North Dakota (up 48 percent), West Virginia (up 41 percent), South Dakota (up 39 percent), Delaware (up 24 percent), Nebraska (up 20 percent), Minnesota (up 20 percent), Wyoming (up 19 percent), Pennsylvania (up 18 percent), Alaska (up 16 percent), Indiana (up 16 percent), Florida (up 16 percent), Nevada (up 15 percent), Washington (up 15 percent), Iowa (up 15 percent), Maryland (up 15 percent), Massachusetts (up 14 percent), Texas (up 14 percent), Utah (up 13 percent), Wisconsin (up 13 percent), and Virginia (up 13 percent). Data Source. On September 14, the Census Bureau released some of the data from the 2016 American Community Survey (ACS). The survey reflects the U.S. population as of July 1, 2016. The ACS is by far the largest survey taken by the federal government each year and includes over two million households.7 The Census Bureau has posted some of the results from the ACS to its American FactFinder website.8 It has not released the public-use version of the ACS for researchers to download and analyze. However, a good deal of information can be found at FactFinder. Unless otherwise indicated, the information in this analysis comes directly from FactFinder. The immigrant population, referred to as the foreign-born by the Census Bureau, is comprised of those individuals who were not U.S. citizens at birth. It includes naturalized citizens, legal permanent residents (green card holders), temporary workers and foreign students, and illegal immigrants. It does not include those born to immigrants in the United States, including to illegal immigrant parents, or those born in outlying U.S. territories, such as Puerto Rico. Prior research by the Department of Homeland Security and others indicates that some 90 percent of illegal immigrants respond to the ACS. Thus all the figures reported above are for both legal and illegal immigrants.